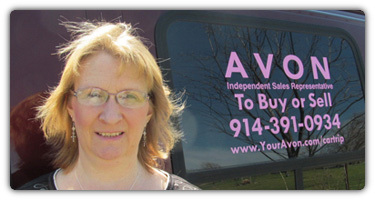 Avon Sales Representatives Earn a percentage on all their product sales. Below is the all new Avon Sales Commission Chart for 2016 & 2017. This chart shows the dollar amount an Avon Representative will earn on Avon product sales. This Commission Chart applies to in person sales, and for the first time new representatives will also earn the same commissions on their Avon Sales Online as well! The best way to explain the Avon Commission Chart is to break down each Earnings Level and look at them in both a percentage, and then break it down further into a single example. First lets look at the earnings levels and see where you begin earning the real money. To begin, Avon incentivizes Representatives to sell a lot of products, and this is evident looking at the raising rates with larger dollar sales. Keep in mind this is sales per campaign, not cumulative over time. Each campaign if you sell in person and online a combined $460. you will fall into the Fourth Tier of earnings, and that is 40%. $0 – $49.99: 0% ~ This is a NO Earnings Example. Reps selling less than $49.99 will not earn any money on sales this size. $50 – $149.99: 20% ~ This is the first Tier earnings - for each dollar sold reps will earn 20 cents. Sell $100. & Earn $20. $150 – $294.99: 30% ~ This is the Second Tier Earnings level, For each dollar a rep will earn 30 cents. Sell $200. and Earn $60. $295 – $439.99: 35% ~ This is the Third Tier Earnings Level, Reps will earn $.35 for each $1. in Sales. Sell $400. and Earn $140. $440 – $924.99: 40% ~ This Fourth Tier Avon Sales Earnings Reps will earn $.40 on each $1. of Avon Product Sales. Sell $600. and Earn $240. $925 – $1574.99: 45% ~ This Fifth Tier of Avon Sales Earnings Level, Reps will Earn $.45 for each $1. Of Avon Products Sold. Sell $1,200. and Earn $540. $1575+: 50% ~ This sixth and highest Avon Earnings Level, Reps will earn $.50 for each $1. of Avon Products Sold! Sell $1,600. and Earn $800.! Avon sales Commission for New Representatives for their First 4 Campaigns is set at 40% This is a long standing and favorite commission rate that Avon has had for many years. It is set like that to allow New Avon Representatives a guaranty of a profit at a time when they are likely to NOT have a large customer base. This is great for new Reps, It gives them, money in their pocket in their first Campaign. In the best of practices this money should be invested right back into a new representative's business by buying Brochures, and samples. In the first 4 Campaigns You should grow your customer base as much as possible. Keep in mind that after your first 8 Weeks you will return to the Commission Chart for your earnings. To stay in the higher Commission range, take the time to invest in your business. Avon also pro-rates the number of Brochures with lower prices per brochure if you buy large lots. Always buy many more brochures each campaign, that way you can pick up a few more customers each campaign. Using the Commission Chart, you should consider setting goals that give you a set number of new customers each campaign + 1, I tell everyone to do that so you are always ahead of your goals by at least 1. Recently Avon Updated it's Commission Chart to reflect it's commitment to Avon Representatives. Avon offers New Representatives a 40% Commission on sales for the New Reps first 4 Campaigns. This works out to be 8 weeks, as each campaign is 2 weeks long. New Reps have the potential to earn enough money to invest in growing their business with minimal or no added out of pocket expenses. If you have just joined my team, or are about to - Use the sign up to sell avon link above! I would love to have you on my Avon Sales Team!